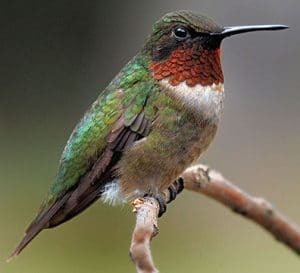 Evolving since 1992 and so named for the smallest annual farm visitors, the migratory Ruby-throated hummingbirds. These winged jewels can be seen and heard frequenting the feeders, native flowering plants, trees and planted pollinator habitats. Returning from Central America to the same sites for nesting and feeding, the male arrives late April, the female within the next 2 weeks. She fashions a large thimble sized nest, 2 inches across and 1 inch deep from thistle, dandelion down, wisps of grasses bound by strands of spider web and pine resin. She firms the base of the nest by thumping on it, while the walls stay pliable to expand with the hatchlings. She smooths and presses the rim of the nest between neck and chest then camouflages with bits of moss and lichen. This 6 to 10 day nest building takes place 10 to 40 feet above the ground. Nests are affixed on the topside of slender downward branches of oak, birch, poplar and pine trees. 1 to 3 eggs, one half inch long hatch in 12 -14 days. Nectar from flowering plants and tiny insects provide natural food sources. Feeders containing a 1 part sugar to 4 parts of boiled water are an additional source of energy for the high metabolism of this little bird with a heart rate that can reach 1,260 beats/minute and a resting respiratory rate of 250 breaths/minute. The farmstead of Hummerhaven, offers a diverse group of species and breeds including dwarf, mini, and heritage. Our free range hens lay eggs hued in green, pink and beige shells with vibrant yellow orange yolks. When in ‘milk cycle’ our cow and goats give a creamy rich milk just enough for our family consumption. We raise livestock for homesteading, education, understanding, animal assisted learning not for market consumption. Our barnyard and pasture population includes goats (Nigerian dwarf), sheep (Babydoll, Tunis, Finn), alpaca, pigs (Juliana mini painted pigs), rabbits (Angora), chickens (Cochin, Salmon Favorelles, Bantam, Araucana, Buff Orpington), ducks (Indian Runner, Rouen, Khaki Campbell), geese (Sebastapol, Embden), mini horses, mini donkeys (Sicilian), mini mule, cows (Jersey), horses and ponies (Gypsy, Percheron, Appaloosa, Haflinger, Paint, Quarter Horse, Spotted Draft and Draft crosses). Barn cats short hair and long, slight built and stocky, tigers, tabbys, inky black, tortie, calico, tawny, grey, blended patterns of spots, stripes, boots and bibs.. the silent, wise whiskered paws patrol of barn, outbuildings, house porches and decks. Our four household canine companions ‘nose it all’ and extend our watchful eyes and ears. Blue eyed red merle Aussie shepherd, Kyra, mind of a herder with patience to move in slow determination, directing, but not scattering the herd. Addie, the lithe spaniel mix, little finesse but lightening speed… Can get over, under, through land and water obstacles, loves a stampede. Ollie, is the farm comedian, laughingly stays on task until… SQUIRREL! And then the German shepherd side leads him on a quest in the opposite direction. And last is mini Aussie, Mona, the crumb eradicator, bluffingly barks fiercely at a knock on the door, pantry protector.